This FY 2020 Indian Country Budget Request outlines federal programs and services that honor the federal trust responsibility, as well as many programs that are critical components of strong tribal economies and public safety systems. 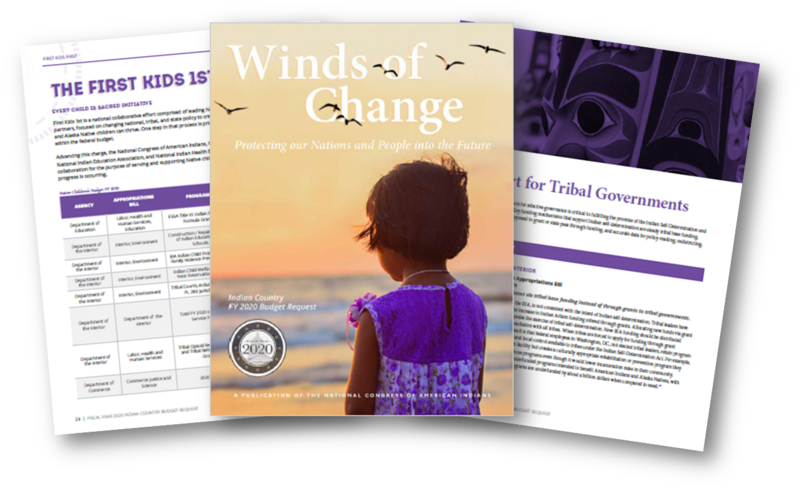 The programs highlighted in this document meet the federal treaty and trust obligations as identified by experts at national and regional tribal organizations and through FY 2020 budget formulation consultations between tribal leaders and federal agencies. Tribal nations are resilient and provide services to around 2 million people; however, we cannot continue to provide for our communities without our federal partners. The often partisan debates affecting the federal appropriations process have an outsized impact on the daily lives of American Indian and Alaska Native people who already face underfunding of health care, education, and backlogs in physical infrastructure – all of which fall under the federal trust responsibility. Heading into the FY 2020 appropriations cycle, the United States and tribal nations face many challenges. Some are ongoing but no less dire, such as climate change, which will affect the fate of our grandchildren and future generations. Other changes involve the increased partisanship that led to the longest government shutdown to date, which poses a direct threat to the welfare of tribal nations and their citizens. With a new Congress though, we hope for a period where we can begin to overcome division and fear to meet the grave challenges before us. Our tribal nations seek only those things promised to us and our citizens by the U.S. Constitution and the solemn treaties and agreements reached between our tribal nations and the United States. When tribal nations agreed to accept smaller land bases, the federal government promised to safeguard our right to govern ourselves, and to enable tribal governments to deliver essential services and provide them adequate resources to do so effectively. Due at least in part to the failure of the federal government to adequately address the wellbeing of Native Americans over the last two centuries, Native Americans continue to rank near the bottom of all Americans in terms of health, education, and employment. The broken treaties have left many reservations without adequate access to clean water, plumbing, electricity, internet, cellular service, roads, public transportation, housing, hospitals, and schools. While prosperity in the minds of many Americans may evoke a version of the American Dream based solely on building personal financial wealth, prosperity for most Native people centers on the preservation and practice of Native cultures and languages, active participation in sacred clan and kinship systems, and close stewardship of tribal homelands. Despite several eras of hostile federal policies towards tribes and severe underfunding, tribal nations are proving successful in their efforts to build sustainable tribal economies and rebuild tribal communities in accordance with their cultural values. If the United States lived up to its commitments to support Indian Country in the ways that it has promised, tribal nations and governments could do so much more. Tribes respectfully request that these recommendations be included in the appropriations process. Download the entire FY 2020 document (PDF) or individual sections below (PDF versions).